Our succulent, sweet, untreated scallops are coated in Panko breadcrumbs to deliver a juicy and satisfying taste. Sourced from the purest waters, Mrs. Friday’s® scallops are carefully prepared and individually quick-frozen to retain their naturally delicious flavor. Sizes for every menu application. 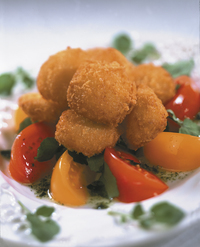 MRS. FRIDAY’S® BREADED SCALLOPS 40/50 CT.